A man was caught reading a newspaper while driving at 70mph during a police anti-speeding initiative in Scotland. Fife Constabulary said that while the driver was not exceeding the speed limit, he was charged with not being in full control of his vehicle. The driver, who was apprehended on the A92, was one of a number stopped during "National No Speeding Day" in Scotland, which ran between 0700-0700 BST on Tuesday and Wednesday. Scottish forces said that a total of 1,894 motorists were detected breaking speed limits compared with 2,145 during the same 24-hour campaign last year. 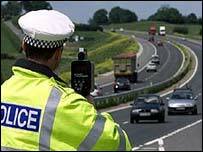 seventeen drivers caught travelling at more than 100mph on the southbound A74(M) motorway. Ian Dickinson, Assistant Chief Constable with Lothian and Borders Police, said: "It is difficult to draw any firm conclusions from a one-day comparison but it is still of concern that nearly 2,000 motorists in Scotland were detected breaking the speed limit yesterday. "One of the aims of the "No Speeding Day" is to focus public attention on safer driving and we hope yesterday's enforcement will have had a positive impact on those who were stopped by police and they will think twice about speeding again. "Speeding is a major factor in fatal and serious road crashes and we hope our action will prevent future heartache for everyone involved in road crashes."